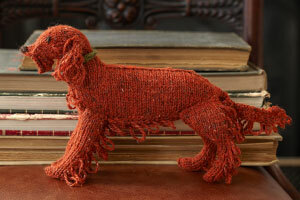 Also known as an Irish Setter, the Red Setter has a long, rich auburn coat; yarn dyes mean ours has a rather more unconventional tandoori tone. A majestic and useful gun dog, Setters are sleek, poised and affectionate. They have the reputation of not being the most intellectual of breeds, but this is the fault of over-breeding and they are in fact highly trainable. Constantly on the go, the Red Setter needs long walks, stick-throwing and entertaining, and in return is loving towards humans.